Your experienced pharmacist can help get your questions answered. Wilson's Drug Store is committed to helping customers in the Bath community. You’ll find every member of our staff to be knowledgeable and accessible. While our commitment to personal service is still the most important aspect of our business, we are constantly expanding to include many patient care services, such as local delivery services, mail services, online refills, diabetic consulting, nand nursing home care. This modernized pharmacy will manage and maintain the intimacy of a neighborhood pharmacy while serving your everyday health needs. We hope you’ll enjoy shopping at Wilson's Drug Store - it will always be our pleasure to serve you. Ellen graduated from Albany College of Pharmacy and has been a practicing pharmacist for over 30 years. 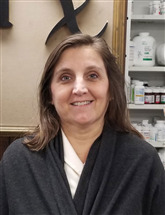 She has worked as a pharmacist at Wilson's since 2013, and became acting Pharmacist-in-charge in 2018.